It took me 6 or 7 tries before I finally figured out September’s MOTM design. I had a glimpse of it in my mind when I first started and then I tried to make it into what I thought it should be. The more I struggled with it the more difficult it was to ‘get it right’…at least in my mind. Then I heard this voice in my head that said “you’re making this too complicated.” That’s when I stopped, took a deep breath, and just let it happen. What you see as the September MOTM, is what came out of me getting out of my own way. How often do we do this in our lives? We try and try and try to make things happen. If we would just step back a moment, relax and just be with it, it will just flow out of us naturally. And more than likely it will be better than what would we try to make happen. 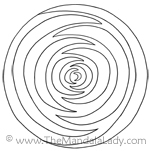 One of my mandalas, “A Maze Zing”, has a powerful message that states: “It’s amazing how simple it is to be at peace. Just stop. And be.” Let that be your mantra for September and ponder it as you color September’s mandala.